an apple a day keeps the doctor away why can’t thousands of apples hanging from acres of trees keep bombs and shells away. Why are the rosy apple-cheeked children not running through the orchards, plucking ripe fruit from the abundant trees? These were the questions that we, the CPT Iraqi Kurdistan team and the Autumn delegation (from the USA) asked ourselves as we visited the mountain village of Merkajia. This tiny settlement is unique in Northern Iraq in that it is mainly a community of Assyrian Christians. One family fled to the valley running from the massacre of Christian population in the years preceding the fall of the Ottoman Empire (1915-19. ) This family grew to over 100 households. Our host, N. told us of his family’s roots on the land. They had planted hundreds of fruit trees, especially apple, grape and quince. These have been destroyed several times through various Iraqi and Kurdish conflicts over the years. But the villagers have persevered and replanted orchards and rebuilt houses. It seemed like an idyllic situation. Apples were hanging in abundance and grapes in huge purple and green clusters. The water of the Kani Rush (Black Spring) encircled each tree illustrating ancient irrigation techniques. As we roamed the orchards with N. he plied us with all the varieties, urging us to taste and to learn that each was better than the last. But N. is living alone in his house. His wife and children are in a city two hours away. They have spent most of the summer separated due to fear. The village is situated in a valley on one side of the border mountains between Kurdish Northern Iraq and Turkey. The sparsely treed peaks are the territory of armed fighters, trying to protest the oppression of Kurds in that country. In retaliation for this, Turkey sends military jets over the mountains in an effort to eradicate this opposition group. The civilian villages are caught in the middle. Thus, the stony roads of the community are now bereft of children’s laughter. N. longs for the day when his family can be together in the village again. However, this will not happen until summer when school in the far away city ends for the older children. And then, the shelling will probably begin again as it has for many summers. The delegates and team members were eager to volunteer to help harvest the mighty bounty of fruit. It soon became apparent that N. was reluctant to show us where and how to do it. Finally, he was honest with us. “There is no market for the apples”, he said. 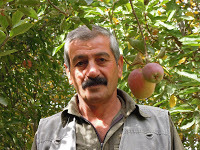 Fruit from foreign orchards can be brought into Kurdistan more cheaply than I need to make the harvest worth my while. Maybe someday soon there will be a window of opportunity when I can sell my apples, but that time is not now.” So we had to be content with carrying two crates of apples back to the CPT house with us to share with friends and neighbors.